During the 20th century, Old Norse philology has been strongly textually oriented. This is evident in saga scholarship, where the book-prose ideology turned the issue of the origin of individual sagas into an issue of direct influences from other written works. This focus has methodological advantages, but it has also meant that valuable folkloristic knowledge has been neglected. 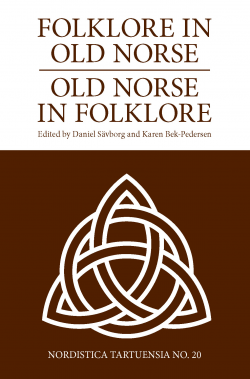 The present volume targets the advantages, the problems and the methods of using folklore material and theory in Old Norse scholarship. An important theme in folklore is the encounter with the Supernatural, and such stories are indeed common in saga literature. Generally, however, scholars have tended to focus on feuds and the social structure of the sagas, and less on encounters with Otherworld beings. In this volume, the supernatural themes in the sagas are discussed by means of several approaches, some folkloristic, some traditionally philological. * Stephen A. Mitchell. Continuity: Folklore’s Problem Child? * Camilla Asplund Ingemark. The Trolls in Bárðar saga – Playing with the Conventions of Oral Texts? * Eldar Heide. Bárðar saga as a Source for Reconstruction of Pre-Christian Religion?